SALT LAKE CITY – Tourism has emerged as one of the key drivers in Utah’s diverse economy, with travelers spending $8.17 billion in 2015 and contributing $1.15 billion in total state and local taxes, the Utah Office of Tourism announced Friday. 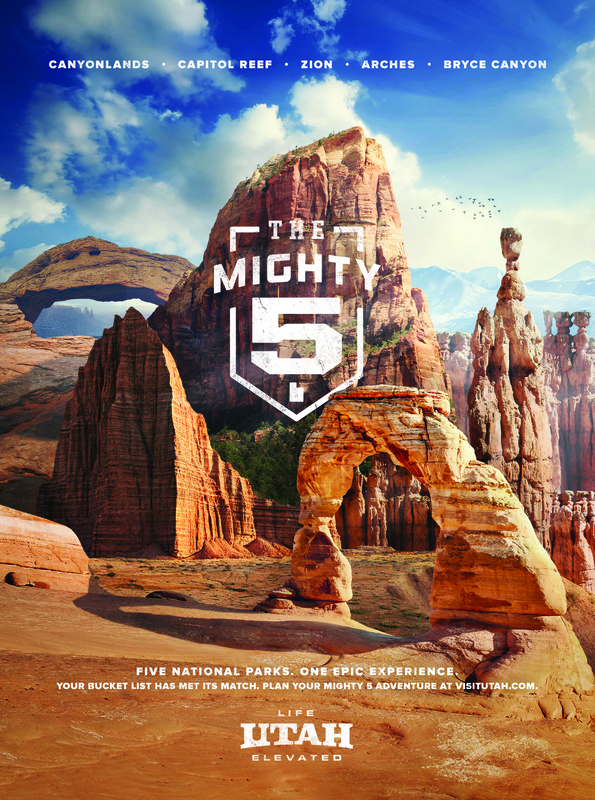 Mighty 5 advertising image. | Photo courtesy Utah Tourism Office, St. George News. “State sales tax revenue generated by travelers helps fund a variety of Utah priorities, including education, public safety, health and human services, road construction and maintenance,” Gov. Gary Herbert said in a statement issued by the Tourism office. “Tourism significantly bolsters the economy and strengthens our tax base,” the governor said. Income taxes from tourism related jobs contributed more than $100 million to Utah schools in 2015, according to the Kem C. Gardner Policy Institute. Motor fuel tax revenue, also known as gas taxes, from travelers contributed more than $100 million to Utah’s transportation and infrastructure. An additional $200 million in state sales tax revenue went to Utah’s General Fund where it was used to pay for essential services including health and human services, corrections, courts and the justice system, public safety and economic development. State tourism officials note that 2015 tax contributions from tourists amount to the equivalent of each Utah household paying an additional $1,235 into the state. “Utah is establishing our reputation as a recreation destination for tourists from all over the world,” Vicki Varela, managing director of Tourism, Film and Global Branding, said. “A decade ago, people credited our red-rock wonders to Arizona and the Greatest Snow on Earth to Colorado. Today, telling people you’re from Utah stirs stories of amazing vacation memories,” she said. Following the success of Utah’s Mighty 5 marketing campaign, the Utah Office of Tourism is encouraging visitors to get off the beaten path and experience The Great American Road Trip on some of the state’s 27 scenic byways. Fly fishing, OHV riding and road cycling are all featured in 2017’s affinity-based digital campaigns. Once Utah gets it’s way and the land is taken from the government so it can be developed and mined and god knows what, you can kiss that $1.5 billion goodbye. Tourists are not going to travel to look at industry where there was once beauty. Fools.